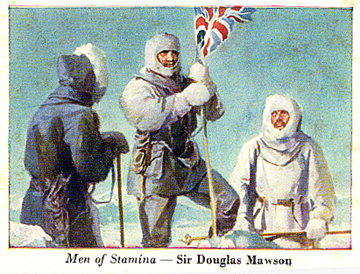 Men of Stamina—Sir Douglas Mawson. 044. AUSTRALIAN MEN OF STAMINA -- SIR DOUGLAS MAWSON. Issued by Stamina Self-supporting Trousers. (1946-1966). Card unnumbered; from Series 8. Size: Ca. 2.4" x 3.15". Recto: View of Mawson, David and McKay at South Magnetic Pole.